This is one two Marbled Godwits in the Big Marsh at Quivira National Wildlife Refuge today. I got in to the Quivira National Refuge in KS late yesterday afternoon. 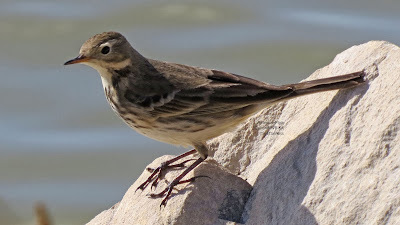 I saw 3-4 of these American Pipits there today. I spotted this light morph Harlan's Hawk in eastern Pueblo County, Colorado this afternoon and was able to get a few good flight photos using my Canon 60d dslr camera with 400mm, 5.6 lens. Distinctive are the white 'spectacles' and pale gray with blackish subterminal band Harlan's type tail. 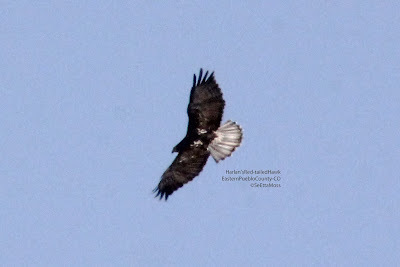 This one has moderately marked underparts with wide black band on rear edge of remiges along with black patagial marks.